Use of this tasty food in both cooking and medicine finds roots all the way back to the Egyptians, Greeks and Romans; who strongly advocated the vegetable’s diuretic properties. The delicate flavour of the plant makes it a delicacy to consume fresh when in season, but it can be stored, dried and pickled for year-long consumption. Asparagus can only be consumed when it’s young, as it becomes woody once its buds begin to open. With water making up 93% of the vegetable, it’s also very hydrating, and offers an amazing source of vitamin B6, calcium, zinc and magnesium. Asparagus is also rich in vitamins K, A, C, B1, B2 and E, folate, and minerals like copper, chromium, selenium and glutathione that promote detoxification. It provides circulation in the kidneys and due to the high percentage of Vitamin K allows your blood to clot normally, protects your bones from fracture and post menopausal bone loss. Included in the superfood’s powerful health benefits is its anti-inflammatory and antioxidant properties, which help reduce the risk of certain types of cancer and chronic health conditions such as heart disease or type 2 Diabetes. The white asparagus variation is achieved by a blanching technique; covering the plant with soil as it grows to prevent photosynthesis. White pale asparagus are consumed as an entrée or a side dish and there are many different ways to prepare them. To prepare thicker, larger asparagus; peel the stems, removing the outer and bottom skin. Wash it in cold water. In this delicious soup recipe by Stacey from goodnessis.com you’ll find all the benefits of this special produce. Asparagus spears make a deeply fresh, light, vibrant and cleansing soup that tastes like spring. They have a short season, and worth buying the thinner spears rather than the 'jumbo' spears whose flavour tends to be disappointingly bland. When buying asparagus, take a careful look at the cut ends to make sure they are not dried out. Avoid cooking in aluminum pans. It can taint the flavour. Once harvested, this vegetable loses it sweetness quickly, so buy locally. Asparagus spears make a deeply fresh, light, vibrant green, cleansing soup that tastes like spring. 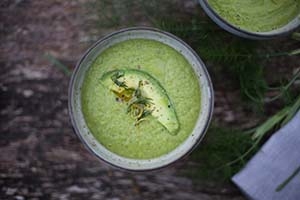 The lemon supports a gentle cleanse, the dill stimulates the digestive juices helping in the bowels movement, while the asparagus promotes circulation to the kidneys and providing a good dose of Vitamins, especially Vitamin K.
The addition of avocado gives this soup a creamy, rich texture, and healthy serving of good fats, aiding in nutrients being absorbed to the body. A drizzling of ghee when serving provides a grounding sattvic quality. Once the weather warms up this soup can be served chilled, season to taste after it's completely cool. Remove the tougher outer layer of the fennel, chop into small pieces. Wash the asparagus, break off and discard the woody ends from the base of the asparagus stalks. Chop into 1-inch pieces. In a medium heavy bottom pan, heat the oil or ghee. Add the chopped fennel, and sauté for five minutes. Stir in the asparagus and sauté until the asparagus is tender. Turn off the heat, allow it to sit for five minutes and transferring to a blender, adding the avocado, dill, lemon juice, zest, salt, pepper and boiling water. Puree until completely smooth, creamy and velvety. Taste and season with more salt, pepper or lemon, as needed. Serve immediately, garnished with thin slices of avocado, lemon zest, extra dill, a sprinkling of freshly ground pepper and drizzle with melted ghee. If not serving immediately, reheat when needed over a low flame.